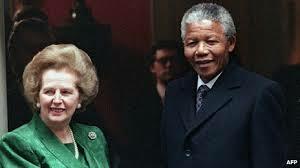 A few days ago a friend of mine emailed me to ask what I thought of Peter Tatchell’s article, “Mandela: Heroic but failed on HIV, poverty & Mugabe” considering that I had been so vocal in the aftermath of Thatcher’s death (See Celebrating Thatcher’s death is wrong both pragmatically and in principle and Thatcher is dead, but Thatcherism is alive: If only it could be the other way round). On the face of it, following my own logic I should have been upset with Peter’s article. I should have been saying, just as I did for Thatcher, let’s give it a rest, let people mourn and leave the politics out of it…for now at least. But I wasn’t and nor did I feel I should be. It has taken me a few days to think this over. In short I think it comes down to a degree of respect for those mourning the death of a loved one. Peter could have waited to write that article, but in the grand scheme of things I am not worried that he did not. Why? Because very few, if any, of those who cared for and loved Mandela would be troubled by Peter’s article. Throughout he maintained a measured respectful tone that didn’t lose sight of the fact a person had just died and that people were in mourning. This is markedly different to the witch is dead celebrations that followed Thatcher’s death. There is a freedom of speech issue here that I will passionately defend. If the state tried to stop people voicing opinion after a death then I would be the first to criticise that. But just because we have the right to do something, this doesn’t mean it is the right thing to do. I would be more than happy to condemn the blithering idiots at the Westboro Baptist Church for producing a video and social media campaign claiming Mandela is going to hell. But do I think the state should stop them from doing this? No. Do I hope (a big hope I know) that someone who was part of this campaign might read this and reconsider? Yes. Do I personally think they were misplaced, inconsiderate and disrespectful to publish such rubbish straight after Mandela’s death? Of course, it goes without saying! Just wait a little while and allow people to mourn before turning to the politics of someone’s life. Judging by the response I got from the Thatcher articles I don’t expect many people to agree with this but hey, that’s OK. I would just ask those who don’t to imagine it was their own loved one that had just died and ask them to think how they would like others to behave during such time.